Biking is a good form of exercise. First of all, anybody can do it. Learning to ride a bike is easy and even if you haven’t ridden in quite some time, you can easily relearn it. Secondly, bike riding is easy on the joints, as it is a low-impact exercise that doesn’t aggravate conditions like arthritis and joint pain. Lastly, bikes are relatively affordable and do not require special training or instruction. All you have to do is hop on to your best bike seat and start cycling to a healthy life. Transportation: A bike is a legitimate form of transportation. If you want to save on gas and gym money you can do so by pedaling to work every morning. You get the workout you need at the start of the day while getting to work at the same time. You do not only get to save on fuel expenses but on gym membership too. Need to shower? Just bring some clean clothes along with you and you can shower to work every morning. Enjoy Nature: When you’re cycling in bike paths it gets easier to enjoy the wonders of nature. According to studies, green spaces can help to lower stress levels. With biking, you are hitting two birds with one stone, getting the exercise you need while de-stressing so that you feel energized and renewed after your workout. Lifelong Activity: Biking is not just for the young or the adventurous. It is an activity that you can do no matter how old you are. Biking can be a lifelong activity you can enjoy alone or with a group of people. Save Mother Earth: Think of how many cars are on the road right now and then think about their carbon emission. Clearly our planet can benefit from biking. If all of us biked several times a week we can drastically reduce carbon emissions in the atmosphere and help save our planet from global warming. Better Time For Cyclists: Bike lanes and bike paths are everywhere. There is no better time to be a cyclist than today. Almost anywhere you go in the United States today there are better places to bike now than 10 years ago. Biking has doubled in the US since the 1990’s with the New York City Department of Transportation estimating that biking has increased 289% from 2001 to 2011. The country is now better equipped to support biking because it has become so popular. Biking is supposed to be fun, not painful, and bikers spend a lot of time in the saddle or bike seat. If you are an avid biker you might have experienced pain due to sitting in your seat for a long time. One of the best ways to choose the best bike saddle is by getting to know its anatomy. Just like shoes, bike saddles are a personal fit and you need to find one that fits you properly. Before you start choosing a bike seat, get to know some of the parts that can make your ride a more comfortable one. Shape. Bike seats have different shapes to conform to different body types. For example, the ischial tuberosities or bike sits for female riders are generally wider than those for males that’s why bike saddles for women are wider. Male riders who use female bike seats could experience chaffing and rubbing. For women bikers, bike seats for men are too narrow and will feel like you’re straddling a banister. For a comfortable ride, make sure that your saddle is the correct shape. To help with this, there are manufacturers that supply bike shops with pads that measure you sit bone width. Shell and Cutout Design. Usually your saddle’s seat is made from injected molded plastic like nylon. In some cases, manufacturers will mix carbon fiber to make the seat lighter. There are also saddles made entirely of carbon fiber not only to lower weight but to tweak flexibility. In the old days, bike seats used to be one molded shell made of plastic. Nowadays, aside from being made from different lightweight materials, bike saddles now have slots, holes and grooves to give riders a more comfortable ride. In most cases saddles, usually have a cutout in the nose so that riders can shift pressure away from the soft tissues to the ischial tuberosities. There is no one perfect shell or cutout design for all riders. You need trial and error to find out which shape and cutout design work best for you. It’s best to try out a few by sitting on them for more than a few minutes to see which ones are most comfortable. Padding. The padding or cushion is what makes the seat more comfortable, especially if you bike for long distances. Some of the most common materials used for padding include urethane foam and polymer gels. These are molded into the shell of the seat to provide different densities and thickness in high pressure areas. There are also bike seats without any padding if you prefer just the carbon fiber. Rails. Chrome-plated carbon steel rails were de rigueur until about 15 years ago when they were replaced by titanium, which is much lighter. Nowadays, titanium is still the metal of choice for many riders who can afford high end saddles. Carbon fiber bike seats are also common and are often wrapped in aluminum to give it toughness. Cover. The cover of your saddle usually depends on your personal choice. Leather is pretty common and is preferred because of its durability. Cover comes in many different material including plastic, snake skin, Lorica (synthetic leather) and even Kevlar. Some covers have grooves or holes to give the rider more friction and prevent them from slipping. They also come in different colors but black is best for hiding wear and tear and fading. Now that you know what goes into your saddle seat you’re probably wondering how to choose your bike saddle. If you’re in the market for a new saddle you’re probably wondering how to choose one or how to narrow your choices. Here are some tips to help you choose the saddle that will fit you best. Cushioning Saddle. This type of bike seat is for riders who bike for recreational purposes. 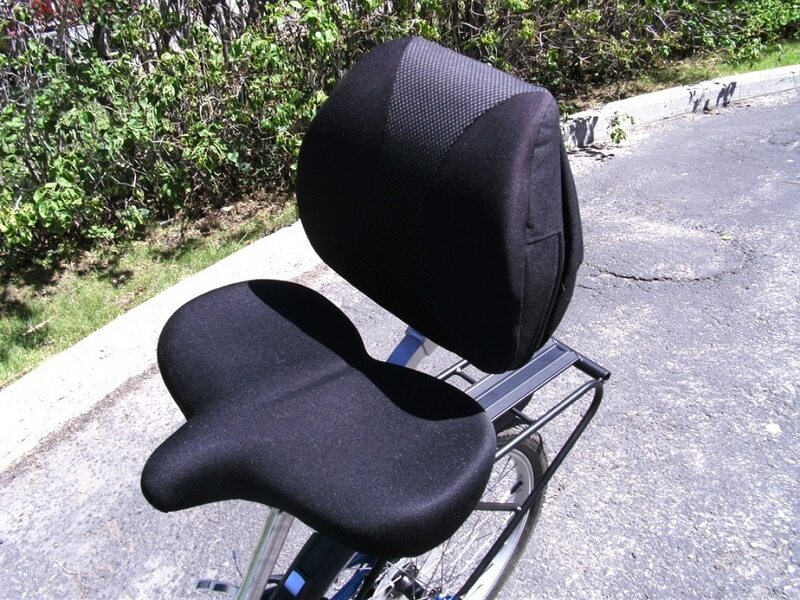 This bike seat is wide and has a short nose, a lot of cushioning and sometimes even springs to give riders comfort. Alternatively, you can opt for a seat post with springs for more comfort for your ride. Performance Saddle. For riders that clock a significant amount of bike time or those that like to race, a performance saddle is your best bet. Performance saddles are longer and have minimal padding because a rider’s weight does not rest on the sit bones at all times while biking. During a race or a long bike ride, riders usually sit in a tucked position which requires minimal padding between the legs for minimal chaffing and maximum power transfer. If you’re new to racing or long bike rides, try a performance saddle with softer cushioning. This way you won’t get uncomfortable while you’re still getting used to the miles. Mountain Saddle. When you’re biking on a mountainous terrain you alternate between standing on your legs and sitting on your saddle. This is why riders need a mountain-specific bike saddle that provides padding for the sit bones while having a streamlined design and shape to help with your movements and a durable cover to withstand wear and tear. Touring Saddle. A touring saddle is somewhere between a performance saddle and a mountain saddle. It provides lots of padding while sporting a long narrow nose. This way the rider has the comfort while sitting in the bike seat while having freedom of movement for a long bike ride. Women’s Saddle. In order to accommodate the difference between a man’s body and the female form, women-specific saddles are wider to accommodate wider hips and smaller bodies. The best bike seat can make the difference between an enjoyable ride and a torturous one. Here are reviews of some of the best bike saddles in the market today. Description: Handcrafted in Italy and designed for riders with rigid spines and low back flexibility, the Fizik Antares features carbon rails and a Kevlar base. The Antares is a flat saddle that is designed for efficient power transfer. This bike seat garners high marks for durability, comfort and versatility. It has less padding compared to other saddles like the Phenom so it is not a good choice for long rides. But if you want power and performance, Antares is the saddle for you. As a high performance racing saddle, it is designed for the rider who likes to move around and use the whole bike seat. It has a good flex in the shell while the nose provides ample support for the rider. The Microtex covering is also advantageous because it allows for easy position adjustment and is not slippery when it gets wet. This saddle is also versatile and can be used on long bike rides, cyclocross races and mountain biking. The Antares can be a bit pricey but it can be worth the investment thanks to its durability and versatility. Description: The WTB Speed Comp Saddle is a popular choice thanks to its affordability and comfort. Made from high grade materials, this saddle has the unique ability to fit almost anybody. This is the go-to saddle for the daily commuter or weekend mountain biker. The Speed is well padded so racers and weight-counters won’t be choosing it anytime soon. However, the generous padding and anatomical groove can give riders relief especially on high pressure point areas. The seat gently rises in the rear to provide riders support when pushing hard against the pedals. This bike saddle is not the best if you want high performance mainly due to the padding. While it does provide the rider a lot of comfort for long rides, it can never be a racing saddle because it can be hard to move around the saddle since the padding gets in the way of power transfer. But despite this deterrent, the saddle is still versatile and can be used for mountain biking, cyclocross and commuting. Despite its price, the Speed is surprisingly durable. The synthetic cover is tough and features a rubberized scuff guard and is mounted on durable steel rails. Overall it provides great value to the rider. Description: The unique air-sprung technology distributes the rider’s weight across the saddle for all-day comfort. The Fabric Cell Radius Elite Saddle has a 155mm width which makes it ideal for daily commute or all terrain riding. Weighing in at 370 grams, this saddle is a bit heavy and won’t appeal to racers however, bikers who prefer comfort over performance will definitely love the simple construction. The Cell has a radius shape and chromoly rails on a nylon base. This construction eliminates the need for stitching and staples which make other saddles look messy. The Cell’s underside has a clean look so it is easy for riders to clean and pick off dirt and mud after a long day in the saddle. During the ride the saddle can feel squishy and soft while the wide design provides support and overall comfort. Riders will notice that the Cell does a good job of distributing weight all over the seat which is very advantageous when you put it a lot of miles on your bike. Aside from long bike rides, this saddle is also ideal for some mountain biking because it doesn’t absorb moisture and is easy to clean. Description: It looks funny but it has the male health in mind. The Selle SMP Extra Saddle was constructed to help alleviate the compression of the pelvic muscles and delivers blood where it is needed so that you can sit comfortably on the saddle all day. Riders who experience numbness, soreness, cramps and constant shifting of position can say goodbye to all of that with the Selle SMP. The saddle also features the unique beak nose design to give riders a base for efforts when climbing and relief during descents. The design also allows for better control of the bike using your thighs. This is one of the most comfortable bike seats in the market thanks to the extra-wide central channel that helps to eliminate pressure in sensitive areas. The elastomer padding and breathable synthetic cover provides extra comfort. Racers will find the extra padding a bit cumbersome but daily commuters and weekend riders will love the comfort and versatility of this saddle. This is undoubtedly the best saddle for riders suffering from groin numbness. Best used for recreational biking and daily commutes. If you aren’t a racer and your priorities are fitness and comfort then this bike seat is worth checking out. Special Features: 100% organic cotton (vegan) Cover with vulcanized rubber base, handmade in Italy, Singular continuous woven carbon base, ultra-light at only 259 grams. Description: Brooks is well known for their leather saddles. The Brooks Cambium C13 Racing Bicycle Saddle is a departure from Brooks tradition sporting a 100% organic cotton (vegan) cover. It is designed to flex in response to the rider’s position in the saddle while absorbing vibrations of the road to provide comfort. Manufacturers wanted to keep the weight to a minimum so this bike seat was constructed using a one-piece carbon braided frame. Despite the modern materials the Cambium has the classic look of most Brooks bike seats with the aluminum rivets attached on top of the saddle. This is a good choice for racers who are focused on losing as much weight on the bike as possible. It provides a comfortable ride despite many hours across many different kinds on the trails. Description: Selle’s Italia is touted as the “super comfort” bike seat. The Selle Italia Vanox Rails Max Flite Gel Flow Saddle has an abrasion resistant cover with soft silicone gel inserts that has different thickness throughout the cutout. It also features a large anatomical cutout so that the rider can shift his weight to optimize comfort and relieving pressure on the pelvic area by avoiding contact with the perineum. This is a good performance bike saddle for racers thanks to the 10% carbon composite which provides strength but without the added weight. The rails have shock-absorbent elastomer inserts to help dampen shock and vibration. Made from vanadium-titanium “Vanox, the rails are lighter than titanium without compromising strength and performance. Description: The K:ium rails of the Fizik Aliente provides 8% weight reduction and better shock absorption while the twin flex technology delivers full-length pressure relief to the rider. The classic shape of this bike saddle and its firm substantial padding provides a comfortable ride. Due to the suede-like material covering the edge of the nose, riders might experience some chaffing. Overall, the performance of the Aliente is good. It is a versatile saddle which can be used on the mountain bike, cyclocross, daily commute and road bike. It can also be used for racing but preferably for racers who like to ride in an upright position. The saddle is impressively lightweight considering its generous padding. It also offers good value for money mainly due to its durability. The K:ium rails are very strong and durable so it can take a lot of abuse on the road. Fizik recommends this saddle for upright riders. It is best suited for riders who use road frame with endurance geometry. Mountain bikers who ride upright will also like the Aliente. When choosing a bike saddle it is better to take it out on a road test first. Some bike stores might allow you to do this. If they do, make sure to vary positions and to hit some bumps so that you know how it feels. Also check the rails if they are strong enough for your riding habits. Most rails are made from chromoly but performance riders should check out rails made from titanium because they are lighter and more durable. Also check out the price of your saddle. As a general rule, prices rise when weight drops. This is usually due to better materials or customization.